treasure trove of more than two hundred poems, this gem of an anthology compiled by Mary E Burt is indeed a most valuable set of poems to read or listen to. 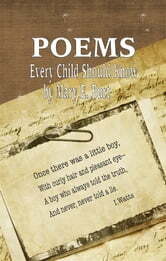 Published in 1904*, Poems Every Child Should Know* contains some well-loved verses like Thomas Gray's Elegy Written in a Country Churchyard, Lewis Carroll's delightful parody Father William, Felicia Hemans' deeply-moving Casablanca and other favorites. It also has lesser-known but equally beautiful pieces like Henry Wadsworth Longfellow's The Arrow and The Song, Robert Browning's The Incident of the French Camp, Eugene Field's nonsense lyrics Wynken, Blynken and Nod and a host of other wonderful verses. For modern day children, unaccustomed to reading and memorizing poetry, the book is a throwback to the days when this was the norm in most classrooms and homes. Fragments from Shakespeare's Julius Caesar, in which Mark Antony pays tribute to the dead Brutus, Polonius' advice to his son Laertes from Hamlet with the stirring lines, “This above all: to thine own self be true...” are some of the masterpieces contained here. iBoo Press releases Worldâ€™s Best Classics, uses state-of-the-art technology to digitally reconstruct the work. We preserve the original format whilst repairing imperfections present in the aged copy. All titles are designed with a nice cover, quality paper and a good font.